Feasts are an important part of life. This is a vitally important fact to acknowledge. That is, every single important celebration is marked by feasting. Eating is a celebration of life. Any diet that does not acknowledge this fact is doomed to failure. We eat cake on our birthday. We eat holiday feasts like Thanksgiving. We celebrate Christmas dinner. We prepare wedding banquets. We go to a nice restaurant on our anniversary. We don’t celebrate with birthday salad. We don’t prepare wedding meal replacement bars. We don’t eat Thanksgiving ‘green’ shakes. We need to acknowledge a fact that we’ve known all along. Weight gain is not a constant phenomenon. It’s an intermittent one. With that knowledge, you can see that a lasting solution to weight gain is also intermittent. 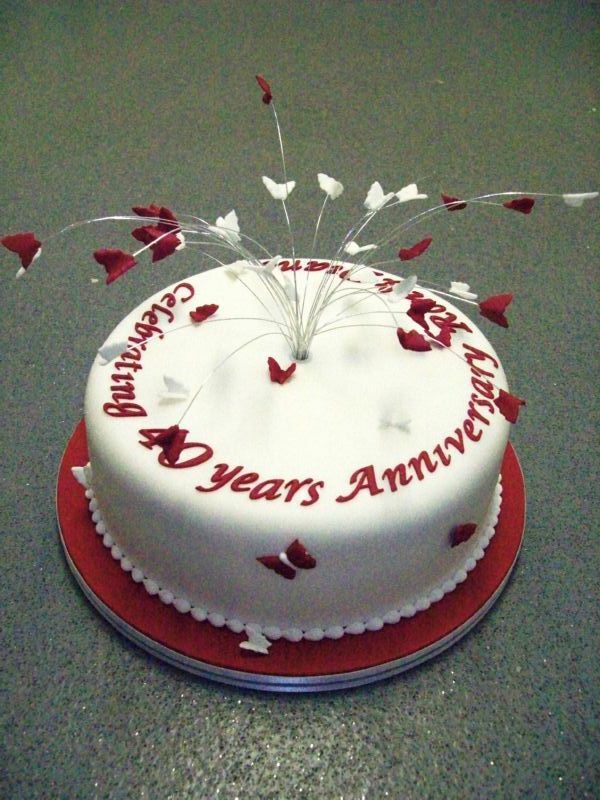 Weight gain varies throughout life, and also throughout the year. Certain periods of life are associated with increased weight gain. This includes adolescence, where weight gain is part of normal development. This also includes pregnancy, another situation where insulin plays a dominant role. Weight gain during pregnancy is normal. However, it also increases the risk of obesity later in life as well – a demonstration of the time dependence of insulin and obesity. This period of increased insulin effect (to help the body gain weight) may have lasting effects. The simplest way to study this question is to compare women who have had children with those who have not. There are multiple problems with this approach since this is not a randomized group, and those who have never had children (nulliparous) may differ from those who have had children. For example, the stress of having children and associated sleep deprivation may have an effect. However, a randomized study is out of the question, so this is the best data we will get. 10 year follow up data from the first National Health and Nutrition Examination Survey (NHANES 1971-75) was used in this paper from 1994. Overall, the women’s weight gain in those with children compared to nulliparous was 1.6 kg after adjustment. With 1, 2, and 3 children the weight gain averaged 1.7kg, 1.7kg, and 2.2 kg respectively, so there shows some evidence of dose-response. That doesn’t seem so bad, does it? But the risk of gaining more than 13 kg was increased by 40-60%! The risk of becoming overweight was increased by 60-110%. So, while the overall effect seems modest, the health consequences may not be so. There seem to be some who are predisposed to gain large amounts of weight with childbirth and many who go back to the pre-birth weights. You probably already know some. This is far from an isolated finding. In 1994, the Journal of the American Medical Association published the CARDIA study also showed a 2-3 kg weight gain over 5 years associated with pregnancy. This happened in both blacks and whites. Waist to hip ratio also increased – an indicator of visceral fat gain – the more dangerous type. Menopause is also associated with significant weight gain. Women were measured during their menopausal years and averaged 2.25 kg weight gain average. Along with this, the blood pressure, serum cholesterol and fasting insulin tends to increase. In men, weight tends to increase in the years after marriage. Married men tend to be fatter than unmarried ones. This does not seem to hold true for women. The main point is this – weight gain is not always steady. Also weight gain is largely a hormonal, not a caloric imbalance. The hormonal changes of pregnancy and menopause can certainly precipitate large weight changes. Trying to battle a hormonal problem with calorie-based weapons is a losing proposition. Other life events often cause or are associated with weight gain. Smoking cessation is a major cause of weight gain. In a NEJM paper in 1991, it was estimated that weight gains average 2.8 kg in men and 3.8 kg in women. However, some people have major weight gains of >13 kg – 9.8% in men and 13.4% in women. Even with a single year, the majority of weight gain happens in a short period of time. 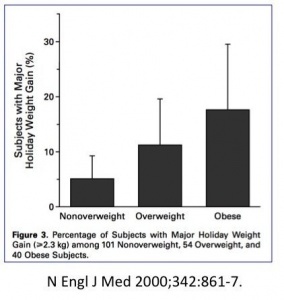 Let’s take a closer look at where weight gain happens in a paper published in the New England Journal of Medicine in 2000 called “A prospective study of holiday weight gain“. The holiday period of US Thanksgiving to New Years covers roughly 6 weeks. Researchers repeatedly measured a sample of 200 US adults to see whether weight gain happened disproportionately during this time. Average weight gain over the entire year averages 0.2-0.8 kg per year. This is close to the 1-2 pound per year average that is commonly quoted in the lay press. In this study the average weight gain over the entire year was 0.62kg. However, this weight gain is not equally gained throughout the year. In the 6 weeks of the holiday period, roughly 2/3 of the weight of the entire year was gained (0.37 kg). In the remaining 46 weeks of the year, only 1/3 of the weight is gained. There is a small attempt to lose weight in the immediate post-holiday period, but this is clearly not sufficient to offset the holiday weight gain. 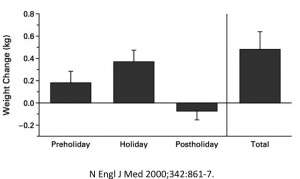 Another interesting finding was that those subjects who were already overweight or obese tended to gain the most weight during the holiday period. This is probably not news to people. The fat get fatter. Those who have struggled with weight for the longest, have the most trouble. This is yet another example of the time-dependency of obesity. One of the major shortcomings of the caloric theory is the overlooking of this important fact of life. If weight gain is not uniform throughout the year, then weight loss efforts also need to vary. You need a strategy of increasing weight loss at times and maintenance of weight at others. A constant diet does not match the cycle of life. Feast and Fast. There are times that you should eat a lot. There will be other times that you should be eating almost nothing. That is the natural cycle of life. If we keep all the feasting, but eliminate all the fasting, then it is rather predictable what the result is. Weight gain. In fact, religions have almost universally acknowledged this fact. There are many periods where feasting is prescribed – Christmas for example. There are other periods of time where fasting is prescribed – Lent, for example. The ancient civilizations and religions all knew this simple rhythm of life. When the harvest comes in, you feast. But you will fast often in the upcoming winter. But now, in our modern day of continuous food availability, religions have prescribed periods of feasting and fasting. We have kept the feasts, but fear the fasts. They have become demonized. And we have paid the price. 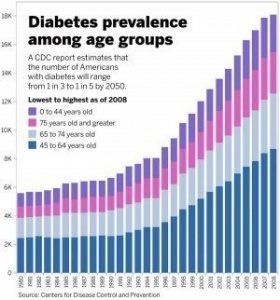 Type 2 diabetes has become an absolute epidemic in all age groups. It seems pretty obvious that this is a balance problem. If you feast, you must fast. If you keep all the feasting and lose all the fasting, you get fat. That’s really not so hard to understand, is it? But what happens when you lose all the feasting? Well, then life becomes a little less special. If you are the guy at the wedding who won’t drink, who won’t eat the cake, who won’t eat the full meal, who won’t eat the appetizers – there’s a name for that – the party pooper. Thanks for another fascinating post. I enrolled in the Intensive Dietary Management program because your blog and videos gave me an easily understandable explanation of what had caused my type 2 diabetes and why my weight loss (which I achieved without any encouragement from my doctors – indeed it was against their advice) reversed the symptoms of type 2 diabetes. Since joining the program, I have been able to abandon calorie counting and to indulge in the occasional feast, mitigated by intermittent fasts, just as this blog entry describes. I can confirm that it works for me! This one concerns me a little. You see! to have gone along with CICO, then, horror of horrors, used the word “moderation”. Only fleetingly do you remind us that the problem is hormonal. Also the word moderation doesn’t actually appear anywhere in the article. Dr. Fung, How do you feel about using the original Fat Fast as based on the work of Kekwick and Pawan in the 1950s for feed days ? Dr. Jason Fung: Theoretically, it should provide much the same benefits of fasting. i keep telling myself “Food is for FUEL” (borrowing from a blog title, i came across. this is a new P.R., having previously gone 53 hours without eating, … and then i ate not out of hunger, but for a long-scheduled concert and dinner date with a friend. good blog-post regarding “INTERMITTENCY” and feasting, as i prepare to visit my folks next week, in BBQ heaven – TEXAS. that will break a 6 to 6.5 DAY fast. 82 hours, and still going strong. 1) At what length of fast does resumption of eating become an issue? 2) Any specific foods with which to ease off of a fast? Fasting becoming an issue is individual. Long fasts need to be supervised by a knowledgeable specialist. I fasted successfully for a week. Had a kidney stone expelled afterwards. Coming out of long fast requires discipline and careful approach. A good warm bone broth, then cabbage salad with little lime or lemon juice (acts like a broom that sweeps the digestive track of impurities). Light veggies soup and scalds for 4-5 days before resuming eating animalroteins. That’s my experience. How many knowledgeable specialists are there in fasting? And where can one find such an individual? Do you really need to eat soup and salad for 4-5 days? Yikes! I couldn’t do that. Maybe for a day, but that’s about it. Bob, many of the fasting practitioners come from a vegan or vegetarian background, hence their recommendations for “light foods” to break the fast. I eat a keto, mostly meat diet and broke my recent 5 day fast with bone broth, waited one hour, two scrambled eggs, waited another hour and ate 8 oz of steak. Ate normally the next day, no issues. Dear Jesse, Same. Did a longer fast (9 days) and felt like I needed fuel at that point. Before that, I had some intermittent hunger (ha! ), but mainly just missed the habit of eating. I’m a huge fan of both Dr. Fung and Megan. did you eat anything in particular for that 1st meal? any stomach pains/problems with starting eating again? I drink bone broth to break my fasts and then an hour or so later have some scrambled eggs. Works really well for me. how long of fasts do you do? goal was 6.5 days, to eat at lunchtime wednesday. I would recommend to avoid meat as your first meal after breaking your long fast. Avocado, softboiled veggies, eggs or a fruit salad could be good for the first day of breaking a fast. Be prepared for a few toilet visits that might not be so pleasant (everytime I have broken a fast I have had water coming out of the second exit). Same with me. I’ve only done fasts of around 3 days duration, but each time, it seems I restart my system, and there’s only water left to come out. I try to increase the amount of yoghurt and fermented foods I eat, though, after breaking the fast. I can’t tell if that helps but it doesn’t seem to hurt. I actually do great with meat after a 3-5 day fast. It is easily digestible (meat only takes an hour to digest) and makes a great transition from eating your own body fat. I start out with bone broth, wait an hour, eat some scrambled eggs, wait an hour and then as much meat as I want. Read it in Prof Tim Noake’s The Real Meal Revolution that he noticed glucose levels going up after watching sports events! His hypothesis is that stress acts as a trigger for increase of glucose levels. Consider meditating and relaxation techniques use. oh, I forgot to add that I have yet to get to the point of not missing food. It’s all I think about but I am hanging in there. Thanks Jennifer:), I know it sounds selfish but I was wondering what is wrong with me, I mean I have fasted in the past with no issues. But something is different this time around. Thanks again for the kind words of support. Fantastic post and this fasting series rocks! As does the rest of your blog. Thanks so much for providing a valuable and accessible resource! To that end; would it be possible to have links at the end of each post in the series to take you to the previous or next post in the series? It would ease navigation immensely. I noticed you used to do this, but some of your later posts are not linked. Cheers! And to add to my query, at what daily calorie intake would you consider it rediced cslorie diet rather than fasting? Thanks! I’m not sure of Dr. F’s opinion. But in my reading of Dr. Seyfried – he recommends: an alternative to this fasting induction: limit carbohydrates to less than 12 grams per day and limit protein to 0.8 to 1.2 grams per kg body weight per day (0.4 to 0.6 grams per pound body weight). With this less extreme plan, he says it may take up to several weeks to reach the recommended therapeutic zone values. Dr. Jason Fung: A very low carb diet with moderate protein should also work. Hello Dr. Fung! I am incorporating a LCHF diet with a 23:1 fasting by simply taking only a meal at the end day. I was wondering if you have any views on the consumption of MCT oil or Virgin coconut oil at the start of the day (during fasting period). I believe this idea has been widely popularized over the LCHF community, but I am interested to hear on your opinion on this. Dr. Jason Fung: I’m sort of neutral on the idea. I think it’s neither good nor bad. If you like it, sure. If not, I wouldn’t start. I’m so impressed that Dr Fung actually responds to some of the posts. I too am not signed up for the program but am seriously considering it. Does anyone know of a medical provider including a nurse practitioner who would closely follow the teachings of Dr Fung in the Philadelphia,PA area. .
Dr. Fung what is your opinion of Dt. Longo’s Fasting Mimicking Diet? Could it be combined with another fasting protocol (i.e. 16-8)? Guys, think of it this way. If you’re doing things right almost all the time, a feast may enhance your adherence to your fasting/IF lifestyle, it will make you feel extremely satisfied (and not guilty like the average dieter). Plus, once you’re able to adapt to a lifestyle that includes fasting and you become a predominant fat burner, fasting itself is gonna be pleasurable and hunger will be the last of your problems. Can you obtain benefits from fasting if you do not follow LCHF diet? Dr. Jason Fung: Yes, but benefits are less. The point of LCHF and fasting is to lower insulin. I have had good results with a LCHF lifestyle and this past year with IF. But, like an alcoholic with that “one drink,” if my Feast Day menu includes not just potato salad and extra helpings but also that cake at the birthday party, it always seems to be followed by a quick downward slide back to sugar obsession. Do you think sugar addiction is real and some of us might always need to exclude refined carbs from our Feast days? Sugar addiction is real and sugar can cause relapses to other drugs of addiction. Hi, I am interested in this program and would like to learn on how to get started with medical treatment or exact protocol to follow. I’m 47 years old from Los Angeles, CA. Have been a diabetic for almost 20 years now, not on insulin but with metformin and glyburide. Sugar levels run high regardless. Your response is greatly appreciated. At 72 hours of a fast that will last a few more days, or until my real weight and my drivers license weight agree. Diagnosed type 2 with my first normal morning BG achieved this morning with a 99. Feel good but would like to see some lower BG readings. Weight is dropping after three months of LCHF, and what was a month long plateau. In May my fasting BG was 275. Thanks for the great blog, you are truly adding original and valuable information for the layman! The link at the bottom of this post leads to part 12 of the “How to Lose Weight” series rather than the fasting series. I’m coming to fasting mostly for the first time although I have been on a juice only diet previously for up to 28 days! Normally dieting or not I take a warm pint of water in the mornings with few spoons Psyllium husks, juice of a lemon and cayenne pepper. I don’t think this has any calories and it stops me feeling empty and also keeps systems ticking over. Any problems with this? Doesn’t the feasting go against low carb which you also recommend? I’ve suffered with obesity and borderline type 2 for decades and arthritis. Out of sheer frustration I researched and started fasting. The results have been overwhelming and purely empowering. The only issue that I fear is that it’s easy to fast at home, but outside we are bombarded with sugar and carbohydrates everywhere. I am praying that my will can be the same in both situations. Thank you Dr Fung! Your researched has really helped me. Thanks for this post! We don’t keep potatoes, bread, rice, sugary desserts in the house, because I consume it all in one day (yes I’ll eat a dozen donuts in one day, in addition to meals and snacks!). Now I’ll have no qualms and enjoy the bounty, and then fast! The handful of times during the holidays we visit others, I had allowed myself, after much-anguished thought, to feast and leave it there else I’ll be consumed with thoughts of stuffing, potatoes on the way home. I feel less anxiety feasting on carbs during the holidays now! I would also say that when you don’t fast, all those “feast” times also become less special. I like fasting in part because it makes feasting the kind of celebration it should be, rather than just more of the same.